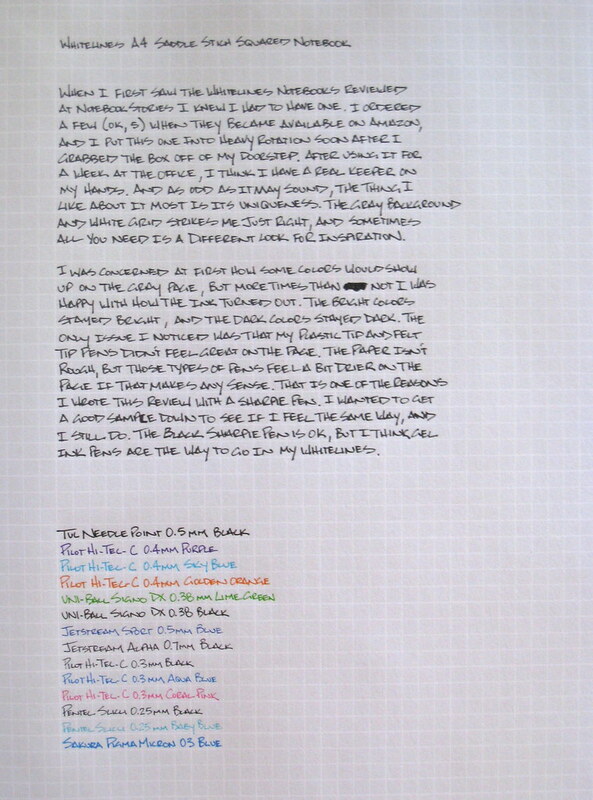 First of all, I would like to thank Notebook Stories for bringing the very cool Whitelines Notebooks to my attention, because prior to this blog post, I had never heard of them. 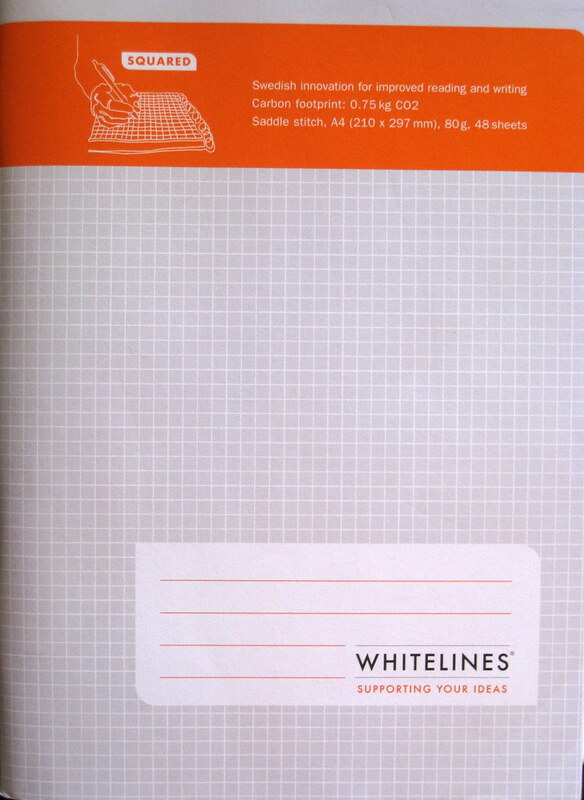 Secondly, I would like to thank Cat for posting on her Twitter feed that Whitelines Notebooks were buy three, get the fourth free at Amazon.com (and they still are). And finally, Visa would like to thank me for allowing them to purchase a minimum of $25 of these notebooks from Amazon (free shipping!) - my bill is looking quite healthy this month. Go-go Internets! Once my package arrived from Amazon, I put the Whitelines Saddle Stitch A4 Squared Notebook to good use right away. I used it at work for a week straight with all kinds of different pens, and other than one exception that I will get to, it passed with flying colors. One thing I was concerned about in the beginning were how my colored inks performed on the grey background, and honestly, they looked as good, if not better on the Whitelines paper than some white or ivory paper I have used. The colors looked completely as expected, and hopefully that came through in the photograph. The one type of pen that did not work that well were my plastic tip pens like the Sharpie Pen. I did the review with a black Sharpie Pen, and it did ok, but my blue Sharpie Pen seemed to drag across the page a little bit - almost like the paper was dry if that makes any sense. I tested with a blue Sakura Pigma Micron and it was essentially the same. Not terrible, but the lines were not as solid as my gel ink pens. Overall though, this notebook far exceeded my expectations. 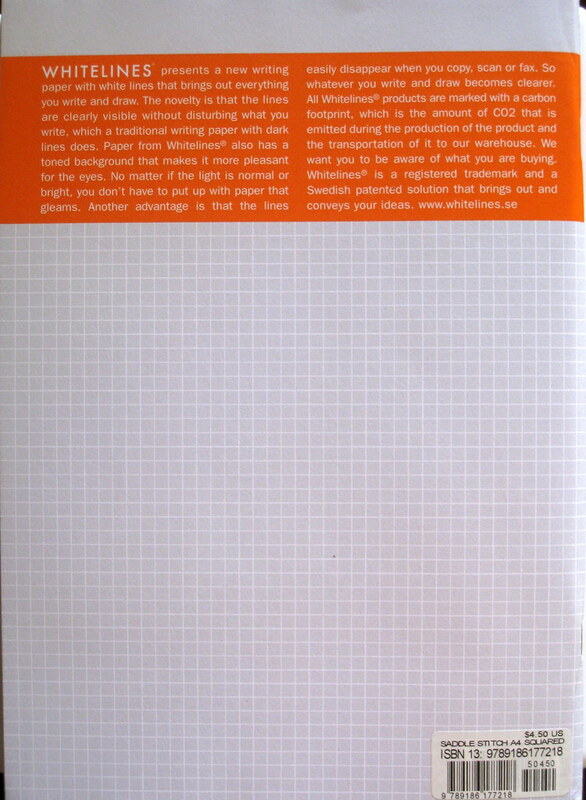 At just $4.50 a pop for 96 pages of 11.5x8.0 Whitelines goodness, you really can't go wrong. Please note that this notebook has a very soft and flexible cover, essentially just a bit thicker than the paper itself. If you are wanting a stronger backing, they also have Wire Bound, Perfect Bound, and Hard Bound models. Just do a search for Whitelines on Amazon.com and you will see them all. Posted on June 15, 2009 by Brad Dowdy.